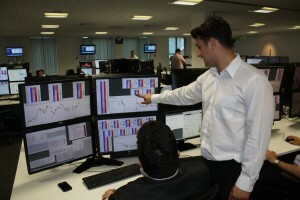 Finance and Investment BSc students have been enjoying a taste of what it is like to work on a fast-paced trading floor. The students were taking part in an open week held in the Brighton office of the financial trading company OSTC. The event was designed to showcase derivatives trading as a career option, while allowing students the chance to rub shoulders with some of the best traders in the South East. The students were also given the opportunity to experience first-hand an interview with the company, as they held 30 minute taster interviews for those who felt up for the task. 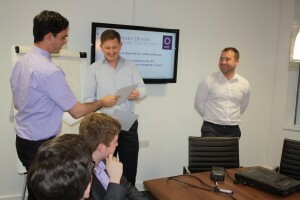 The students also took part in a competition to see how they might perform as traders. A number of trading consoles were set up and the students had 30 minutes to make as much money as possible on a virtual trading platform. The winner and runner up were rewarded with £75 and £25 of Amazon vouchers respectively. See website for more details about our undergraduate and postgraduate Finance and Investment courses. Tagged finance and investment, OSTC, trading. Bookmark the permalink.